All right ladies. It’s time to bust out those quoting skills and try your emotions on another Fangirl Therapy competition. We all have quotes that float off the lips of our favorite ladyBAMFs and lodge into our brains. Perhaps we constantly reblog them in gif sets on tumblr, or we jot them down to motivate us when we’re sinking in self-doubt. It’s time to share that BAMF wisdom in a friendly little competition. How to participate: Email your favorite BAMF one-liner to me at fangirltherapist@gmail.com, tweet @fangirltherapy, or drop the quote in my tumblr ask. Anyone can be quoted, as long as it’s a fictional character. One entry per human. Deadline: Friday, October 3, noon EST. I’ll pick my ten favorites, and let everyone vote. The prize: Kidding. I mean who wouldn’t want a Diane Lockhart coucharm mug? For the prize I’ll put your winning quote on a mug and mail it straight to you! 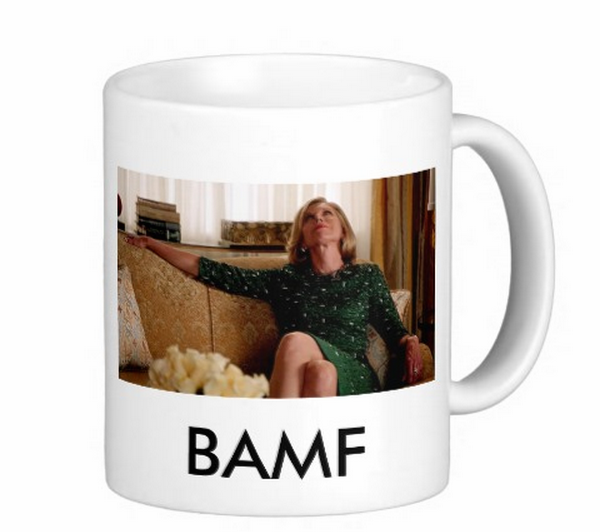 So you can drink your coffee and your BAMF wisdom every morning. So there you go! Start pulling quotes and keep on BAMFing. You are currently reading BAMF One-Liner Competition! at Fangirl Therapy.